For a commercial kitchen or even a regular kitchen that sees a lot of activity, a commercial-style faucet is recommended. These heavy-duty models are characterized by being taller and being made of parts that are built to purpose. This article is a guide to some of the best commercial kitchen faucets in the market. We have also included a buyers guide to show you some of the things to look out for when shopping for one. This semi-pro commercial kitchen faucet features a minimalistic design. Although it might not seem so impressive on a first look, closer scrutiny will reveal just how functional this faucet is. The Hansgrohe Axor Starck has a solid brass body and a ceramic cartridge. Both features are renowned for ensuring long term durability. Furthermore, its slender form and practical design make an attractive kitchen fixture and a highly functional model as well. Furthermore, efficiency is another top benefit of this faucet. First, it sports a spout arm that is able to swivel in all directions (a full 360 degrees). it also produces two spray patterns which you can easily toggle with the push of a button depending on how you want to use it. Besides these, you will also find this faucet very easy to maintain. Thanks to its tarnish resistant chrome finish, you will spend less time cleaning this faucet. Hansgrohe 10820001 Axor Strarch applies QuickClean technology that makes removing residues fast and easy. Some of the things that your faucet need to withstand are calcerous water, dirt and others. Hansgrohe has silicone nozzles fitted to its shower jets and faucet aerators, rubbingg off the limescale is easy. This latest innovation adds great value, as products are well-maintained and will be limescale free and remain functional longer. Probably one of your main concern when buying a new faucet, is the installation. This faucet is easy to install because it has flexible connections. Because this faucet has the ability to bend the water connections, installing it to smaller countertops is much easier and more convenient. In terms of design, this faucet from Blanco is arguably the simplest on our list of commercial kitchen faucets. Yet, this award-winning model is definitely one of the most elegant and functionally adequate faucets. It comes in both chrome and satin nickel finishes that stand out in any type of kitchen. This, together with its solid brass build ensures that it stays attractive and in top shape even after years of use. A ceramic disc is a component that most top rated kitchen faucets have and this faucet isn't missing it either. Thus ensuring drip-free use for a long time to come. It sports a flexible steel spring which makes it quite easy and convenient to use. In addition, its handle stays in front of rather than moving behind the faucet. This makes close backsplash installation possible. In addition, a magnetic spray holder helps to keep the spray head in place. Blanco 441332 Culina has been given 2011 Red Dot award for its design. Red Dot Award is an international design for communication design, product design and concepts. This Blanco Culina has dual spray feature which is very reliable in rinsing salad leaves and fruits as well as filling pans and pots. Switching from regular to wide spray is easy. You can add a rocker switch that lets you alternate from wide spray then to regular mousseur spray. Another good feature of this kitchen faucet is its quick release magnetic hand spray. You will not have any problem using this faucet because of its flexible steel spring spout. Kraus KPF-1602SS features a heavy-duty commercial styled spring design. Additionally, it has an industrial aesthetic appeal that adds a contemporary feel to your Kitchen. A comfortable height coupled with a pull-down functionality ensures absolute flexibility of this faucet. You also get seamless control of temperature and flow with just a single lever. On top of all these, there is a diverter on its spray head. This allows you to change flow type from stream to spray with a simple toggle. With this commercial kitchen faucet, you can now multi-task with as little effort as possible. In terms of durability, this faucet is by far one of the best. Buyers can choose between commercial grade stainless steel finish or chrome finish both of which guarantee long term usage. It also has a lead-free brass build. Also, components like Neoperl aerator and a precision Kerox ceramic cartridge ensures reliable drip-free use. You can consider buying this faucet if you have plans of upgrading your kitchen faucet. It is very durable because it is made of brass. Also, the chrome and stainless steel finish are resistant to rust and scratches, so you are assured that you can depend on this faucet for years without any problems. Other impressive features of Kraus KPF-1602SS are the pre-rinse spray that will help you in cleaning the dishes. As a whole, Kraus is a reliable brand. For those who find this brand less reliable because it is less popular and cost less, you might think again after reading this review. Geyser produces one of the perfect commercial kitchen Faucets out there. There’s plenty to love with this product beginning from its design and the seamless way it operates. The Geyser GF51-S has an ample height and features a pull-down design with a spray head that swivels in all directions. These ensure that you get plenty of space to fit in any size of pots with optimum maneuverability. A single lever handle also makes easy one-handed control possible. This faucet is made from 304 Stainless Steel and has a Brushed satin finish. This, in addition to its versatile and attractive coiled spring design, makes it such an elegant addition to any commercial kitchen’s countertop. Geyser stainless steel coiled spring has streamlined styling and great performance. 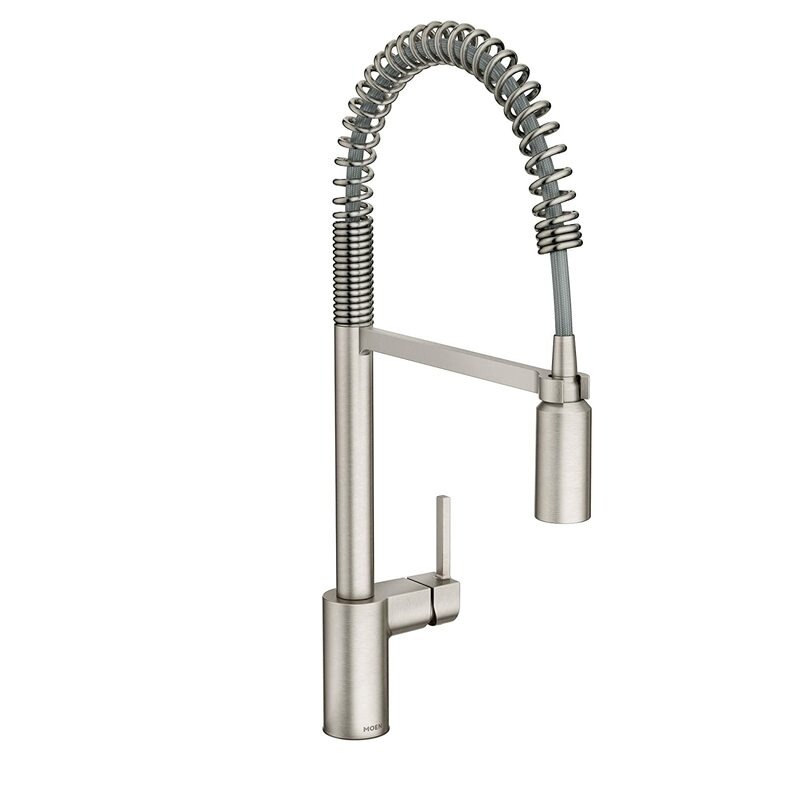 With its single-handle temperature and volume control, this faucet is a great addition to any commercial kitchen. 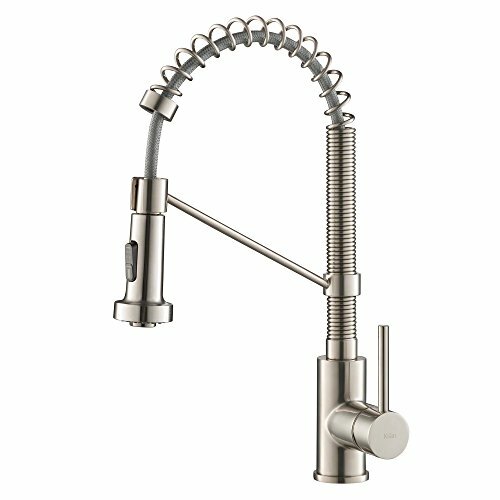 If you have a restaurant business, this Howard Kitchen faucet is a must have. The height provides enough space and flexibility for filling pans and pots. The lever handle is easy to operate. Other features which make this faucet very reliable are precision Xerox cartridge, versatile coiled spring faucet neck and it applies spray/stream function. All these features make the Geyser GF51-S Geyser Faucet a perfect choice for any type of kitchen. This upgraded model of the Gicasa commercial kitchen faucet is a perfect combination of sophistication and fashionable style. It perfectly complements any type of kitchen. Not only does its sleek look adds elegance to your countertop, but it is also designed for seamless functionality as well. This faucet’s sturdy brass build ensures long term durability, while its ceramic cartridge reduces the possibility of the faucet dripping or leaking for a long time to come. A versatile coiled spring neck design coupled with its 360 degrees Swivel spout helps to improve reach and gives you complete access to every part of your kitchen sink. You can be assured of tarnish and corrosion free faucet thanks to a brushed nickel finish among other amazing features. Gicasa offers a 5-year warranty so you are assured that you will not have any problem in case you have a defective or dripping faucet. If in the past users are complaining of leaking spout and leaking hose, these things have been resolved already and you will not have any problem with the updraged Gicasa. This is one of the best-selling models in the market today, and it is also one of the highest rated faucets. The advantage of choosing this faucet is that it comes with a great price. Normally, commercial style faucets are a bit costly, but with Gicasa this is not the case. Actually, this faucet is cheaper as comparerd to other models. One of the things that will probably stand out when you see this faucet is that fact that it comes with two nozzles. Unlike in other models, each serves different needs delivering spray and stream flows individually. However, it is certain this isn't the only thing you’d love about this faucet. In addition to its simple and sleek design, its brushed nickel finish makes it just the perfect fit into any kitchen style. First a high spout design coupled with it 360 functionality ensures that you get enough workspace in the sink. This features also increases maneuverability and makes it useful for all sink size and types. It is controlled using a single lever which not only makes it more comfortable to use, but fewer levers and button means less chance of getting worn out parts with time. This faucet also has a heavy duty build. Although the heavyweight might be a turn off for some, it also provides a guarantee of durability due to the strong and sturdy build. This stainless steel commercial grade faucet is not just an attraction in your kitchen but is also very reliable. It can fit any interior and will help enhance your kitchen. This faucet has a dual function pull-out sprayer that provides an aerated stream. The faucet also has a powerful cleaning rinse feature that will make your washing task much easier. The aerator is made of ABS plastic. The main body material is brass and the valve is ceramic. The handle makes use of stainless steel where the spout is made of zinc alloy. The spout reach is 7.09 inches and its height is 5.51 inches. Its overall height is 7.89 inches and 2 inches mounting shank is needed. Kraus has always been a leading name with making top grade Kitchen faucets. 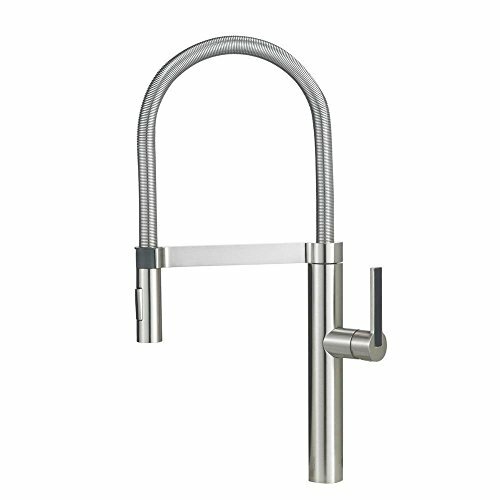 This commercial Kitchen faucet is another high performing product from Kraus. 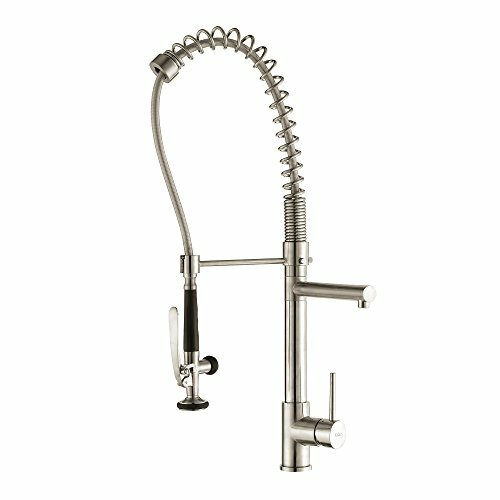 This pull-down faucet features a long retractable cable which offers greater flexibility of operation. it has a convenient spout height which allows it to fit in even when you are space constrained, without getting in the way of your kitchen work area. This dual function sprayer has been engineered to deliver a splash-free aerated stream. It can also deliver a high-pressure spray as well both with just the flip of a button. This faucet comes installation ready with pre-attached water hoses and other pieces of hardware. They make quick and easy installation possible even without a plumber. After cleaning all the dishes, you need to clean the messes on your sink. This is not a problem at all, with the Kraus smooth-retract nylon sprayer hose, you can reach all areas of your sink. The hose can be extended up to 20 inches. Cleaning the spray nozzle is also not a problem. All you need to do is to remove limescale and mineral build-up from the sprayer soft silicone nozzles by just swiping it with your finger to have a powerful flow continuously. With its dual-function sprayhead with a rocker switch, you will not have a problem switching from aerated stream to powerful spray. This makes washing and rinsing veggies to scrubbing easier. 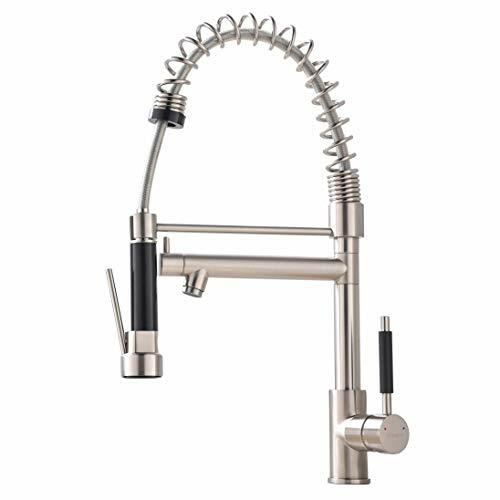 This kitchen faucet is another top quality product that deserves a place on our list of commercial kitchen faucets. Its 20 inches highly flexible pulldown hose gives you extra reach around your kitchen. Combine that with its 360-degree rotation and 2 function spray mode and you’ve got a multipurpose faucet. On top of that, a stainless steel finish makes it an elegant addition to any type of kitchen. This faucet is quite easy to install and you can be sure of durable performance too. It comes with all the hardware components needed to install it. In addition to the 3/8 inches water hoses and 1/2 inches adapter, it is also inbuilt with a ceramic disc valve. This guarantees long term drip-free performance. Also, this faucet is also quite convenient to maintain. Thanks to its touch clean technology, you can rest assured that there will be no hard water build up on the nozzle which further prolongs its lifespan. Kingo Home Lead-Free is the cheapest pullout faucet but it does not compromise the quality. This features a new design which makes it a great addition to any type of kitchen. The swivel spout, pull out sprayer and quick connector hose including the sturdy construction is what most people love about this brand. This is a registered brand from the United States and you can see its logo on all their products. To guarantee the consumers that it is very durable and made of high-quality material the company offers a lifetime free replacement for its faucets. It also offers a 90-day return policy. You will not have any problem installing it, as all the hardware needed is included in the package. At a very affordable price, the features and quality of the faucet are far better than others. If you have a big family and washing the dishes is a big issue, the best solution is to install a kitchen faucet that can remove stains fast. Moen 5923 Align Kitchen Faucet might be the solution to your problem. It has two different spray patterns and longer reach as compared to the ones provided by other models. This kitchen faucet can remove stains with ease. 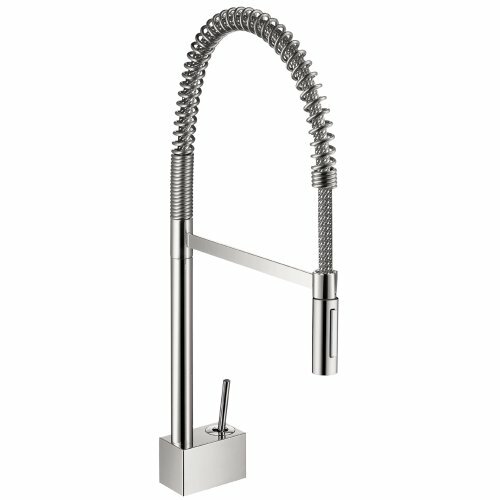 Moen 5923 has 22.5 inches long neck and a 10-inch spout reach. It makes the faucet functional and also makes it look amazing when its docked. As compared to other brands the reach is 4 times longer than other brands. The faucet hose offers flexible water delivery and it retracts easily, you will not have issue about it. Your washing task is simplified with this ultra-flexible hose. The hose delivers high-pressure, powerful spray as it minimizes the amount of residual water around the sink. Installing is not a problem as it has a duralock quick connect hose system that provides a streamlined design. Adjusting the water flow is not a problem at all with its one-handle lever. You can turn it off with ease, increase its flow and set it at medium flow. It provides an aerated stream for daily cleaning and powerful rinse for your heavy-duty cleaning. Mounting the tool is easy, simply follow the instruction of how to mount it in your sink or countertop. The company has been providing amazing products that will last for a lifetime. 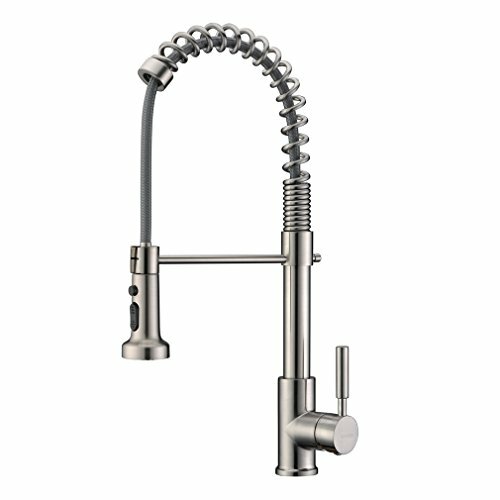 Just like other products, the Moen 5923SRS is developed to boost your kitchen experience with unique style and performance. This product is designed to expand your reach with its ultra-flexible hose and with its pull-down wand. For versatile cleaning, it has two sprays to increase water flow. In handling stubborn stains this feature is very helpful. With its impressive mirror-like finish and exciting, industrial aesthetic this will surely get the attention of many on any room it is installed. If you are happy with Moen 5923 Single Handle Kitchen Faucet, this Moen 5923SRS can also make your washing task much easier. It has spot resist stainless finish that resist water spots and fingerprints. This will provide a cleaner looking kitchen. Moen 5923SRS offer a Power Clean Spray Technology that provides 50% more spray power against most of our pullout and pulldown faucets without this kind of technology. Its faucet pulldown hose gives flexible water delivery and retracting it is not a problem at all. It's Durablock easy to connect system for ease of installation. The single handle lever makes adjusting the water easy. Because of its rinsing power especially during heavy duty cleaning makes easy with aerated stream. Its cleaning standard design installs on the countertop or sink. This product complies with Americans with Disabilities Act ADA standards. A lot goes into buying kitchen faucets. However, you can find the right model for you by following these important criteria. As you probably know already, commercial kitchen faucets are taller than regular models. While this is good since it improves the look of the faucet in a restaurant kitchen or any other kitchen it is installed, it can pose a challenge as well. You need to compare the height of the faucet you are buying to the space you have available on your kitchen counter. This means buying kitchen faucets without considering how much clearance space you have might be a problem. Similarly, you also have to check and compare the height with your sink depth. A tall faucet on a shallow sink will result in quite a lot of splashing. Most of the time, the mere fact that you are considering a commercial styled faucet means you will be having a lot of activities in your kitchen. Which makes water pressure an important point to consider when picking out a faucet. You must ensure that your local water source is sufficient enough to meet the water pressure of your local source. You might have a hard time cleaning the large number of dishes you want your commercial faucet to be able to handle. A commercial kitchen gets a lot of activities and the longevity of your kitchen faucet depends to a large extent on its build. You should pick a finish that will be easy to clean without scraping off the coating as you do so. Additionally, the finish also adds an aesthetic appeal to your kitchen. This is why you must ensure that it fits right in with your other kitchen fixture. Like every household item, it is important that you are getting your faucet from a trusted seller offering a long warranty period. Although, the best types generally have a long lifespan, you should always pick a product with the longest warranty. A long warranty is an assurance that the manufacturer trusts their product and will stand behind it for a long time. Thus only makes sense to buy a highly rated product with a long warranty. As compared to conventional faucets, commercial grade faucet has a good height. This is actually one of their best features. Because of this, filling large pots is fast and easy. You might have a problem dealing with it if you have an old sink. The height could be a drawback particularly if you plan to install the faucet between two counters. So, you need to consider the space between your top and bottom counter before installing the faucet. This only means that you need to focus on the depth of your sinks. If you mount a faucet with higher height on a shallow sink, the water will scatter all over the kitchen counters and floor once you use the faucet. It will only add more chores, but it can also damage other things around the kitchen. The type of faucet you will choose will depend on your kitchen design. An expensive faucet might not fit a kitchen with less elegant design. It may also look awkward when compared with other kitchen appliances. Because of this, it is important that you consider the tone of your kitchen - contemporary, vintage, modern, country style, others before replacing your faucet. 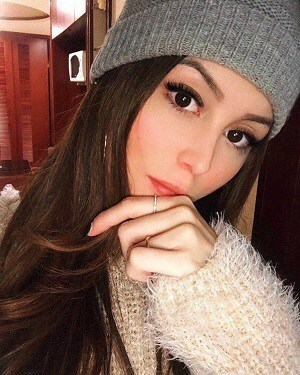 It is important that you should not compromise the utility. Most of the best commercial-style faucet focuses only on aesthetics. Make sure that it is easy and convenient to use and not just appealing to your eyes. Faucets are used repeatedly every day for many years so it is important that you choose the right faucet that is not only good looking but also durable. You should not put quality over the look of your faucet. It is important that you have some knowledge of what to focus on when it comes to finishing, compression, internal designs and others. Some aspects that you need to consider is the quality of the valves. Premium quality valves will not change once you start moving the handle from cold to hot. To avoid situations like burn accidents, scald guard or temperature limit features are important on single control faucets. ✔️ Widespread faucet which includes a spout, cold water valve, hot water valve installed separately on the counterto. ✔️ Two-handle center-set faucet it has both the spout and the two valves in one base. 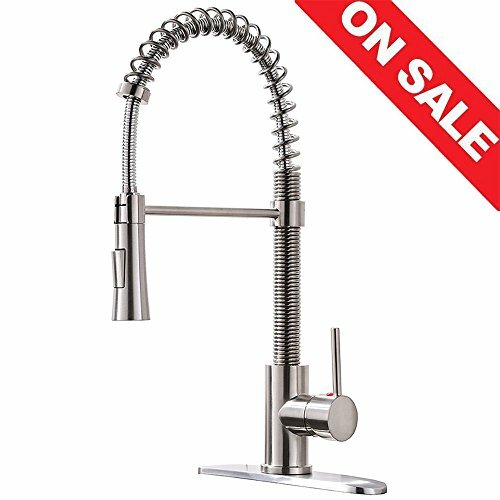 ✔️ Single handle center set faucet where the cold and hot water are controlled by one lever or knob that is commonly a part of the spout. ✔️ Pull-down faucet the most popular type of kitchen faucet these days. Its main feature is the goose-neck spout. ✔️ The pull-out faucet has a detachable handle that can be pulled out. ✔️ Handsfree/Motion Detect Faucet has a sensor inside the tap body that detects any movement. a) How long a commercial kitchen faucet usually last? Most of the time the kitchen sinks are made of acrylic that usually lasts for 50 years. The kitchen faucets normally work for 15 years. b) What are the materials used in manufacturing faucets? The faucet body is usually made of brass, chrome-plated plastic and die-cast zinc. Other single-control types of faucet use a plastic or metal core, which functions vertically. c) Why do faucets drip? The faucet washer is forced against the valve seat, and the friction produced every time you use it causes it to wear out. Thus, dripping occur around the spout. For dripping that is caused by worn out rubber washers can be resolved by placing a new washer. This type of leak usually occurs in a compression faucet. d) What makes the faucet leak on the base? If you notice water seeping around the faucet base this type of leak is caused by a cracked or dried up internal O-ring. The least reason of leakage can be caused by a worn inner cartridge. e) Why is my Moen faucet drips? Moen faucet leaks due to worn O-ring. The other cause of leaking faucet is having a single handle. In replacing the O-ring, simply turn off the water to the faucet below the counter. f) How to lubricate faucet, if it becomes stiff due to limescale build up? You can use malt vinegar to effectively dissolving limescale. Disassemble the faucet and then soak the components overnight. After this, you can scrub off the limescale easily, and the faucet can move smoothly if you re-assemble it. You can also use a solvent product like calcium and limescale remover that will strip the residue from your faucet components. The best lubricant to use is silicone grease, this is effective without damaging the rubber material. To deal with mineral deposits you can get a water softener to reduce the buildup. g) What is the best flow rate for ideal kitchen faucet? The ideal flow rate is 2.2 gallons per minute. 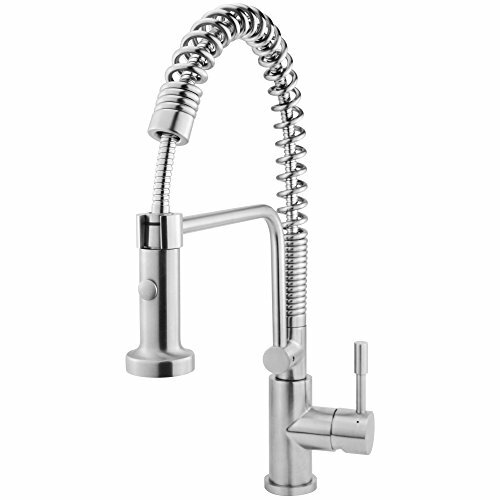 Almost all new kitchen faucets today have an aerator, the screw-on tip of the nozzle on the faucet. For bathroom faucets, you need a restrictive flow of .5 or 1.5 gallons per minute. h) Can you use kitchen faucet in the bathroom? There is no design policy that does not allow using a kitchen faucet in the bathroom. You can install your favorite kitchen faucet in the bathroom without any issue. It can make your bathroom looks elegant and stylish. 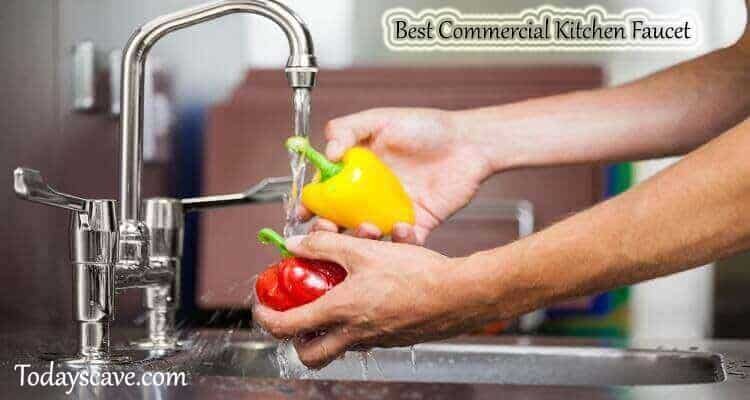 With this comprehensive guide and our reviews of some of the best commercial kitchen faucets, choosing one should be easier. This compilation covers some of the best models out there, but they aren't the good ones around. At the end of the day, your choice should be one that appeals to you the most and serves its purpose optimally.